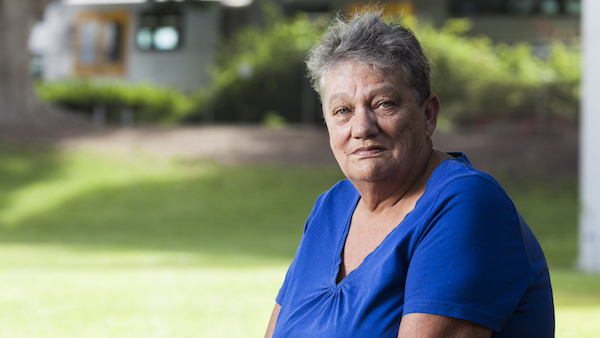 As an elder and a leader in the local Indigenous community, Lyn Martin has led a life of challenge and resilience. Inspired by her mother, who she believes was the strongest person she’s even known, Lyn rose against her stern father and studied to be a nurse by 16. She married young, and raised three children as a single mother, despite being told she would never be able to give birth. She sees her character as being defined by strength, and her ability to support herself on her own terms. Her story is an inspiring one, told with hope and courage. Lyn Martin. Well I mean my married name is Martin, but my family are the Coopers – my family name is Cooper. I was born in Paddington Women’s Hospital, 1948. Can you describe the place where you spent your childhood? Bondi Beach, Tamarama Beach, Bronte Beach – I grew up there. For a short time we lived at Bass Hill in those Igloo Hut things because my father was in the navy, and they gave mum, my sister, and I housing in these igloo things. Then we went back to Bondi Beach to live with my great aunt and we ended up getting a flat there because mum didn’t like the housing that the navy was supplying. Yeah so it was down on the beach; I’m a beach bunny. Is that why you have those blue eyes? I got them from my father, he’s got eyes like blocks of ice. He used to scare all my boyfriends off. Can you tell us about a memory from your childhood? A sensory memory; a meal, or a smell? I don’t remember a meal, I eat everything. And it all smells good. But yeah, the smell of the beach, the smell of the ocean, the smell of the salt, the sound of the waves breaking. You could hear them through my window – we were that close to Tamarama beach. Seaweed… yeah I remember those sorts of things. I always associate it with the water. Where does water come into your life now? Not very much, we usually try to get down to the beach. Not Bondi any more – it’s too crowded. But we go down at least three or four times during the summer months. I take the family, we grab the car, take a picnic, and we go down to Austinmer, around that way, and I get that sea breeze, and I get the salt spray. And if they’re lucky now I only go and put my feet in the water. I’ve got a costume, I put it on, but not as before. I think it’s just age more than anything. I mean, I used to ride a surfboard, but now I’m a bit frightened of going any further than the waist up. I’m very heavy now and I’m scared I’m going to drown. You would never drown! You used to surf! It’s hard to believe I feel that way, but I really do. I really do. Even getting into a swimming pool, I like to know I can reach the bottom. I think its because I’m so heavy. I used to belong to the Bondi Revellers, which was a swimming club, and I used to swim with the Bondi Icebergs in the winter. And I used to race, represented NSW before I decided I didn’t want to go any further. I could swim; I was like a fish. But now I don’t trust myself. In my younger days, I was very a strong swimmer. But now I don’t live in a situation where I can walk out the door and walk down to the beach. It’s only when ‘I get in the car and I have got to drive miles to get there’ type of thing. And as I say, I’ve got a lot of weight on me, which I didn’t have when I was younger. I just get this sense… I’m scared. I think if I got into trouble – if I fell off a boat – I think I could get myself out of trouble. But it’s just not the same anymore. At this moment, I’m living in Greenacre, on a rented premises – very small house. Does it feel like home? No, no, not really. I don’t know where I want to be home. Because we only live in rented premises, and the last place I was in I was there for 8 and a half years, and he [the landlord] came and only gave us two weeks to get out. And we had done a lot of stuff to that house. And it sort of put me a bit on edge. I didn’t know where to start packing, if you understand what I mean? The house we came from had five bedrooms, it had two lounges, a great big entertainment area, and I’ve gone into teeny weeny little three bedroom, one bathroom, and sharing a lounge room with other people. I know the other place was still rented but I had been there so long, it was like mine. He [the landlord] didn’t even give me time. When we moved into that place there was no garden. I created the garden, I had created that all up the side. Vegetable gardens in the backyard – I had no time to lift any of that up. Not that I had anywhere to put them, but yeah, that was hundreds and hundreds of dollars of plants. The time is nothing because I like gardening, but I’m very despondent about everything. I had someone ask me if I got my tomatoes in, and I don’t intend to. I don’t want to do it. Because I’m very unstable about whether we are going to stay there and what’s going to happen, you know? Maybe that’s still the same story? Nah, that’s just a bit you’ve gotta go over. It’s not the whole story. What dreams do you have for your future and what dreams did you have when you were young? I don’t know if I ever had any specific dreams of anything, as far as my work life was concerned. As a child, I always said I would be a nurse. I had to fight tooth and nail with my father, because in those days you needed to have parents’ consent. I completed my schooling when I was sixteen and a half. My father got me a job in the office of a shoe factory. It was alright. The ladies I was working for were quite nice but I still kept going to the hospital. And I used to sit outside the matron’s office, and when she’d come out she’d just look at me. I’d spoken to her and had an interview but she wouldn’t even consider me because I was too young. But I thought I’d wear her down. And I did! My father went away to sea, so he was away for two years. So I went home to work on my mother and my great aunt and finally got their permission, and then went back, and the matron said yes, I could start in the next intake. So I got in to become a nurse. Being as young as I was, they were very careful with me – and when you first go in you do a six-week block where it’s just studying. You still had to dress up in your nurses uniform, but you went in and you were just doing paper work. Studying about this and that, general care; how to feed a patient; how to wash a bed pan; how to wash a men’s urinal (I’d never seen one of those before) and all that sort of thing. But after those six weeks you start in the ward. They sent me to the children’s ward. At this hospital it was just a small one in the Eastern Suburbs, its not even there any more. It was originally an army hospital during the war for recuperation for soldiers in the navy and then they turned it into a General Hospital. It just had a male and female ward and a small kids ward. The only time they ever had kids there was during the holidays when they’d come in to get their tonsils out. In those days they were very short staffed on nurses, so they’d get busy and one of the other wards would call up and say “can you spare someone?”. And she’d say, “yes I can, ok” and off I’d go. Because I was so young the nurses had taken me under their wings. So, instead of going and doing what I should have been doing in the pan room, doing things like scrubbing pans and such — and in those days the syringes had to be scrubbed and put into a steriliser, they weren’t disposable, you know— instead of doing all that dirty work, or what they call ‘dirty work’, they were taking me around with them and telling me about the sort of work they were doing so I was so far advanced, practical wise, not book wise, but practical wise, that it wasn’t funny. And I was just streamlining through all my classes, because when I’d come to a question in the exam, I’d be able to think back and say ‘miss so and so’ or ‘that patient in bed so and so’ had that – it was really quite good – none of it came out of a book. I wasn’t quite reading up on very much and in the end I got through, but they did warn me that when we finish and all the other girls in my class graduated, and I couldn’t. I had to wait until I was twenty-one. I didn’t think that was going to be a problem, not when I was sixteen. But when I was twenty and they had all graduated and I didn’t, it was a bit… you know. What they should have done was let me go up with them to the graduation. I went to the graduation dance, but they all went up on stage and got their certificates, and I didn’t. They should have let me still go up there and give me something, and then I would’ve been quite happy to sit back and wait for it until I turned twenty-one. When they should have sent the certificate out, they sent me two because I went and did theatre [training] for twelve months. So you’re a trained nurse? And a theatre nurse too? I wouldn’t say I’m a theatre nurse. I just wanted to go and study theatre while I was just waiting around. Because I couldn’t work as a registered nurse until I got my certificates you see – so I either had to go and do another course, or I had to go and work as a nurses’ aid, because I couldn’t stay at the hospital while I did my training. It was a training hospital, and unless they offered you a job, you couldn’t stay. And they couldn’t really do that because it’s only a small hospital and they only have X amount of trained nurses and the rest are all trainees. So I went and did that. So I ended up getting both. And then I went and got married and I fell pregnant. I wasn’t supposed to, and it’s really funny that I wanted to be a nurse because my great grandmother was a midwife in the Burrarong valley. And what happened after you fell pregnant? I got very, very sick, I hated it! Heard of morning sickness? I had 24-hour sickness. Honestly, I blamed my mother, I blamed my husband, I blamed everybody. I ended up having three children, but I only had two and a half when my husband walked out on me. The problem was that when I was twelve years of age I was told I would never have children. I had a lot of problems with my womb. I had an inverted womb, all sorts of things. I had so many problems with my periods. I was only fourteen when I asked for a hysterectomy just to get rid of the period business, I didn’t want it, because I used to have so much trouble. Many times my periods would come on to me like that (clicks), I would get terrible pains in my stomach, and next thing I’d have a rush of blood. I’d be walking down the ward and next thing I’d feel blood running down my leg and I would faint. And they all knew and they would rush up, throw a cover over me, and carry me down the ward until nobody could see me, and then I’d wrap the thing around me and take off. It was terrible periods, days and days, I would gush and gush and gush. Many times I used to have just lie on the bed. So, that’s why I wanted a hysterectomy. Because that all started right from the word go when I was just twelve years of age – but anyway they said I couldn’t have children, but I did. I had three. So, he knew before we got married, because my mother told me I had to tell him right, so he was fine with that, and we did think for a while that we were going to save money up and go travelling around Australia. Because, I have never wanted to leave Australia. I’ve had many opportunities to go overseas, but I always knock them back. I don’t go out of Australia. And everything that happens overseas just reinforces that. Why do you want to go over there? And there is just so much here. I have been all around Australia, except for Tasmania. I’ve been in every state, but I haven’t seen all of it. I’ve never been to Uluru, I’ve never seen the desert, or central Australia, and if that was something I’d go to see all of that. There is just so much to see within this country that I can’t see why. And if I was to go overseas which I wont, I’d want to go to China – I love the Chinese, I love Chinese food, I like their paintings, clothing, statuettes. I like things about China. Strength in character I suppose – you do have to be strong. I mean I ended up with the three kids on my own, and I had to just belly up and go back to work and do it, because there was no pension or anything like that back in those days. I was back working when my youngest son was only four days old and I needed the money. And strength in character, I mean you’ve got to have it. Like, my mum had no money, she was only ever in rented premises, she worked for a living, my father is a very hard man, and they separated and she got not one cent of him and when we were kids she was saying to him, like my sister was a very good ballet dancer, and she wanted to send her to ballet school, and if she wanted to do things like that for us, she’d have to find the money for it, so she went back to work. Right? And she worked very hard, she worked in a factory, she worked in a printing factory and she was truck driver and when she went back to the printing factory, and she worked until she was seventy years of age, she always paid her own life and helped us kids immensely throughout our whole lives, both financially, physically and emotionally. And you want to talk about strength? I think my mother had the most, and that is one thing she has taught us; to be very strong. We had to stand up and do our own thing – we do not ask for things. And I know that there is that ‘Aboriginal card’ there but I’ve never played it. I’ve never denied it – I’ve always said “I’m Aboriginal,” but I never claimed any money for my children, and I’ve not allowed my daughter to claim money for my grandchildren. So yes, strength in character – you get knocked down so you get up and you soldier on. What’s the most difficult thing you’ve had to overcome? Being on my own. And I am yet to overcome that. I have always had things to do for people, I actually took an early retirement, I took a package because I had an uncle who were very ill, and his family wouldn’t have anything to do with him, so I took it on to look after him and that was for about two and a half years. And when he went, I was a bit lost for a while, and then my mum got sick so I looked after her. I don’t mean that I moved in with them or they moved in with me, but I was a carer, I wasn’t getting paid for it but I was running them to doctors appointments and that sort of thing. But mum died. Tristan and Nicholas (are now) working and Lara’s now out of school and she’s working, and Jared’s off to uni, and while I’ve got a lot of acquaintances, I don’t really have any friends as such, I haven’t had time. Yeah it could happen I don’t know. I don’t know, its just something I have to overcome that’s why I keep myself so busy. I’m involved in a lot of things around the Bankstown area, and people ring me up to see if I can do something, and if I’m available, and they do have to book me in, but I do have to do it because what else am I going to do? Get ill, be bored? I really don’t have any dreams for the future. I just go day by day now. I don’t think about what’s going to happen in two years from now. Freedom… being able to do what I want I suppose, I think it’s to be able to do what I want without having to answer to anybody, I’m free (laughs). Not much. I love my children, I love my grandchildren. I do not believe in being in love, I don’t think I ever have been, even with my husband. I think it was more infatuation – unfortunately if I hadn’t married him I might have been better off, but then I wouldn’t have had my beautiful grandchildren, right? Love of family more so than anything else and love of country – that’s about it. I don’t believe in sloppy stuff, I don’t read it and I don’t watch it on TV, I watch things that have been taped so when it gets to the kissy poo bits I skip it over to the next part. Thank you for a great insight into your life.